Come and stay in our beatiful country house. 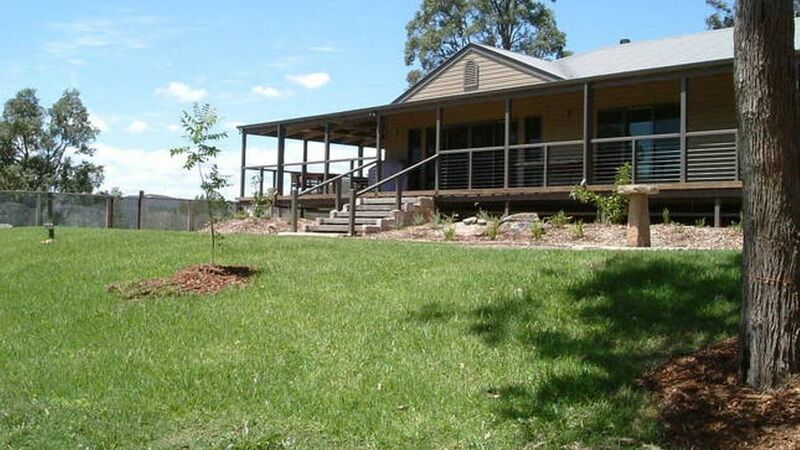 Wollombi Farm is a self contained house set on 100 acres on the Wollombi Brook just 2 minutes from the historic Village of Wollombi, which was first settled in 1820, located in the Hunter Valley and only 1 1/2 hours from Sydney. For couples and small groups who want spaciosness and seclusion, Wollombi Farm has everthing for you Hunter Valley country retreat. Wollombi Farm has 2 kms of the Wollombi Brook as part of it's boundary, it has over 5 kms of bush walking trails which can take you along the river or to the top of the mountain for some great views and photo opportunities. The House is set high above the Brook with fantastic views from each room out over the countryside towards the Wollombi Village to the South and to the north a peaceful view watching the Horses, Cattle and Kangaroos graze. The house features four large air- conditioned bedrooms which can accommodate up to 12 people, 2 bathrooms, spacious air conditioned living areas with log fire, flat screen TV, DVD and CD player with stylish decor throughout. There is a full gourmet kitchen with gas stove, microwave, dishwasher and Carrara marble benchtop with all the cooking and serving dishes. The covered front veranda with hooded BBQ is wide enough to dine on with a setting for 12 people and commands spectacular views overlooking the pool and the river to Wollombi and the Brokenback Range. Our Rates without the Breakfast Hamper are $130 per person per night, Min. 2 Nights, Min 3 Nights Long Weekends, Min $520 per night.This includes all the Items in the Pantry as listed on our Website. The hamper includes orange juice, cereals, sausages, bacon, eggs, mushrooms, tomatoes, bread, butter, Twinings tea bags, Filter coffee and Moccona coffee. It also includes all the items in the well stocked pantry which includes olive oil, balsamic vinegar, mustards, tomato and BBQ sauce, vegemite, honey, jams, cling wrap, aluminium foil, along with salt and pepper, sugar, flour, rice and various herbs & spices. Also included are paper serviettes and kitchen towels, garbage bags and dishwasher tablets. Our weekend check ins are from 10.00am on Fridays, with late checkouts on Sundays of 3.00pm or later by arrangement. The house has 4 Bedrooms, 1 King double bed (can be Separated int 2 King Single beds} 3 Queen Beds, 3 Single Beds and 4 Rollaway Beds and can accommodate 12 People in 12 Beds. To secure your booking we require a $500 deposit by credit card, this can be done on our website. The Wollombi Tavern, home of Dr Jurds Jungle Juice,, Snack Bar open for Lunch 7 days a week, Dinner Friday & Saturday nights. Undercliff winery & gallery where you can purchase the famous Undercliffe wine recognised by the beautiful hand painted drawings on the label with a different bird for each vintage. Great Northern Trading Post & General Store has a fully licensed Bar and great meals on Friday and Saturday Nights once. Tulloch Wines -The home of Pokolbin Dry Red, Hector Tulloch first released the Pokolbin dry red label for Shiraz wines in 1952. This medium bodied Shiraz is produced from grapes grown in the Parish of Pokolbin, some vines of which are in excess of 100 years. Located in the Heart of Pokolbin, the award-winning Tulloch Cellar Door is a must visit Hunter destination. Tempus Two Winery -Come enjoy a fine range at the acclaimed Pokolbin cellar door. Such a lovely house. Very well kept, clean and easy process to hire. Would love to come back. We spent 4 nights at the beautiful Wollombi Farm House. It has everything you need for a relaxing holiday. The house is amazing and fully stocked with all the essentials. The beds are so clean and comfortable. We all enjoyed sitting around the beautiful fire at night relaxing and spending time together. The breakfasts that were provided were delicious. Thank you so much Peter for all your help and we will certainly be back to Wollombi Farm. This property is spectacular. It was immaculately clean and had everything, above and beyond, that you need for a wonderful home away from home experience. The beds were super comfy, the pantry was well stocked, the furnishings and fittings were top quality and the spa and pool were wonderful bonuses. It is located close enough to the village of Wollombi and wineries, yet secluded enough to provide a relaxed and quiet stay.We will definitely be recommending the farm country house to others. Thanks go to Peter, our host, for his friendly assistance. We had a fabulous time at Wollombi farm. The house is as beautiful as it looks in the pictures and the owners have gone the extra mile to include the little things that really make your stay more enjoyable. The hot tub was a real treat and we enjoyed many barbecues overlooking the stunning vista. It was still a bit chilly in the evenings but we had plenty of wood for the fire - a perfect spot to enjoy a glass of wine and read a book. I highly recommend and would love to return in the future. Fantastic place! We had a fabulous stay! Thank you so much for having is in your beautiful house. Nestled amongst the gum trees it was just the break we needed. Highly recommended.. Even better than the pictures!